I collect a lot of different older recurves. 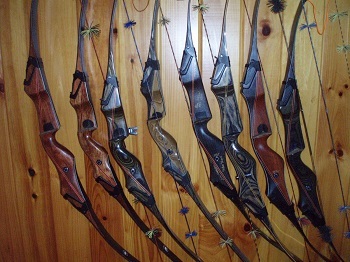 I agree that Browning used some of the prettiest woods in their bows of any of the manufacturers. I am also fond of the Wasp and Cobra lines. Soemthing that I have noticed that may or may not be a function of the Browning bows and their limb design is that I see a lot more twisted limbs on Browning bows than on about any other make. I don't know if that had to do with design as they do seem to be faster than most other contemporary bows or just the way they were stored by their owners. Maybe I have just had a run of bad luck in the Brownings I have looked over. I like (and have/had) the Nomad I's, Stalkers. I really like the looks of the Cobras, but every one I had stacked something fierce - but I doubled & even tripled my money on them. Had a couple Gordon's I liked too. But there's really no rhyme or reason to the collectors' market; there are far away more old Bears out there than anything else, yet they command the highest prices - go figure? Anyway, just be happy there's a lot Brownings still around at fairly reasonable prices. My first bow was a Safari 1, in '67. I still shoot it! My first bow was a Browning Safari and I still shoot it!